Schools in Chennai may either be run privately, or by the Tamil Nadu government, or be run privately with financial aid from the government. The medium of education in private schools is English. Government run schools offer both English and Tamil medium education, English being preferred by a majority. Private schools are usually affiliated to the national CBSE board or to the Tamil Nadu State Board. A few schools are affiliated to the ICSE board and the Montessori system. A few schools also offer the International Baccalaureate and the American systems. Schooling begins at the age of three. After two years of kindergarten and twelve years of schooling, students take up professional university courses. The University of Madras (1857), which has three campuses in the city, offers a range of programs in liberal arts, science and commerce. A large majority of city colleges are affiliated to the university and offer programs in medicine, law, science, Arts and commerce. Some such older institutions are the Presidency College (1840) and the Madras Medical College (1850), both of which affiliated themselves to the University of Madras on its formation. Other autonomous educational establishments include Loyola College (1925), the National Institute of Fashion Technology (1995) and the Madras School of Social Work (1952). The Indian Institute of Technology (IIT), Madras (1959), is located in the south of the city and is internationally renowned for its engineering program. Located nearby, is the main campus of Anna University (1978), which formed from a merger of the College of Engineering, Guindy (1794), the Madras Institute of Technology (1949), the Alagappa College of Technology (1944), and the School of Architecture and Planning (1957). Almost all colleges in Tamil Nadu that offer programs in engineering, technology and architecture are affiliated to Anna University. 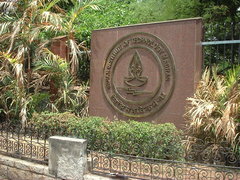 The remaining colleges are autonomous Deemed universities, such as Sathyabama.